The bridge in Kabul, Afghanistan is a filthy and disgusting place. Smelling of human faeces and vomit, this is the makeshift dwelling of hundreds of homeless Afghanistan drug addicts. As the difficult to watch (for reason of its material and harsh depiction of human hardships) film informs at the start, 90% of the world’s opium is grown in the country with more than 11% of the population addicted. Laila is the Mother Teresa who brings the addicts home, feed, clothe and more important, try to get them clean and to stay clean. This is her story. Laila is shown as a dedicated mother of sorts but not without faults. She can be too forward, loud, and bossy, especially when trying to get government aid for her exploits. 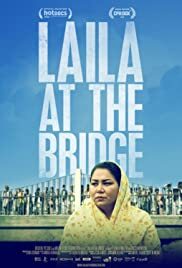 The film shows two crucial scenes at the bridge, one with her distributing limited food and the other searching through the rubbish for a convert. The film ends on a note of hope with her possibly having a way to get funds for her project. The film is also made more alive by examining a few addicts in detail, one of whom is Laila’s brother who is presently clean and helping her, after 25 years of addiction. A very eye-opening documentary set in a country with a culture North Americans know very little about.